Bloggers Quilt Festival .... Go vote!!! Oh my goodness, I never thought in a million years that my mini quilt would be nominated for the Blogger's Quilt Festival! I was nominated for the mini quilt category, and yes, I might have done a little celebratory dance! Here she is in all of her glory! If you haven't been following the Quilt Festival, you really should go check it out. Amy from Amy's Creative Side has outdone herself again. There are a slew of categories that you can vote for, and the talent out there is amazing! So go check it out and cast your votes! You will definitely be inspired by all of the amazing projects! 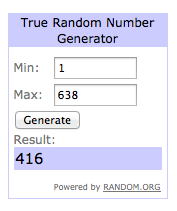 Sew Mama Sew Giveaway Winner! Well it's that time ...... The wonderful Giveaway Day has ended and it's time to find a winner of the Chemistry Jelly Roll ad the Always and Forever charm pack. Number 416 .... Katie... who said, "I'm loving A Walk in the Woods. Thanks for the chance to win!" Katie, I have emailed you and when I receive your contact info I will send a package your way! Thank you everyone for taking the time to stop by my blog and hopefully we can start a new friendship together! I am hoping to have some exciting things going on this summer! Sew, Mama, Sew's Giveaway Day is finally here! We have the day off from school today, and my to-do list today consists of finishing a couple of quilt tops, and sitting on my couch and scouring all of the wonderful items up for grabs today! Of course I am joining in on the fun and I have a couple of things to giveaway tas well! Everyone loves fabric, right? Well, this giveaway is for a jelly roll of "Chemistry" and a charm pack of "Always and Forever". By the way, this is open to all international entrants! The giveaway will be open until May 25, at 5pm. And make sure you go and check out all of the other amazing giveaways going on! There are two ways to enter so leave a comment for each entry that you complete! 1. Leave a comment telling me your favorite fabric line at the moment. 2. Become, or already be a follower! That's it! It's pretty simple. You do not have to do both things to enter but it will give you more chances to win! Thanks for stopping by and have a great time checking out all the amazing giveaways! I am super excited about my first link up with Amy's Blogger's Quilt Festival! I have followed her festivals in the past, but now I have finally decided to participate! I'm not gonna lie, I am a little intimidated of all the talent that will be showing up, nevertheless, I will link up anyway! Julie of, Jolie Maxtin, and I started a new swap last month. The Modern She Made Swap has been a great success for our first round and I have finally finished my project for my partner. My partner loves color, hand quilting, and flea market fancy. So I tried to combine all three elements into her mini quilt. This was the first time that I really dove into english paper piecing. Don't get me wrong I have done a little here and there, but never as the bulk of a project. I also added some hand quilting. Hopefully my partner will love it as much as I do. It will be making it's way to it's new destination in the next week or so. So here it is, my submission to Amy's Blogger's Quilt Festival. Here goes nothin'! Pam ... who said, "I have a quilting frame that I would love to have a dead bar for." Congrats Pam! I have sent you an email. Thanks to everyone who entered, and never fear, there will be another giveaway shortly! The Sew, Mama, Sew Giveaway Day is coming up, so keep your eyes peeled! Hey there! I'm Lori Hartman. I love creating things in my spare time. The quilting/sewing community is made up of the best people so let's get to know each other! It's always nice to meet people that get excited about fabric like I do. Fugly Fabric Party! It's giveaway time! Modern She Made Swap Progress!